On the industrial waterfront of North Vancouver, British Columbia, Alan Dawson and Burton Drody have begun building a 72-foot expedition-style yacht that that should be worth waiting for. If you want to buy her, waiting may be part of the game. They own and operate ABD Enterprises, Ltd. Their specialty is building aluminum boats for the commercial market. When I stopped by recently, they were a day or two from delivering a $3.5 million, 19-meter pilot boat to the B.C. pilots&apos; association. Dawson and Drody began building the big yacht a couple of years ago. It was on speculation; they had no buyer in sight. Then, the association came by with a contract for a pair of 25-knot boats that will carry pilots from Vancouver out to freighters and cruise ships approaching the city from Georgia Strait. So, they did what we would all do: they moved the yacht out of the production line and parked her in a corner of their yard and went to work on a sure thing with a guaranteed pay check. The aluminum fabrication is complete on the yacht and her expedition-style bow towers high above the ground and buildings and cars parked nearby. Her bulbous bow was just the right height for a friendly pat as I walked by. Windows and doors have been installed to keep weather and wandering birds out. The interior is vacant and the open spaces seem enormous. Dawson has marked with yellow tape the outlines of furniture, the galley, a settee, a dining area. There is no wiring, no plumbing, no engine. Dawson estimates she&apos;s about 25 percent complete. Now, why wait for this boat? 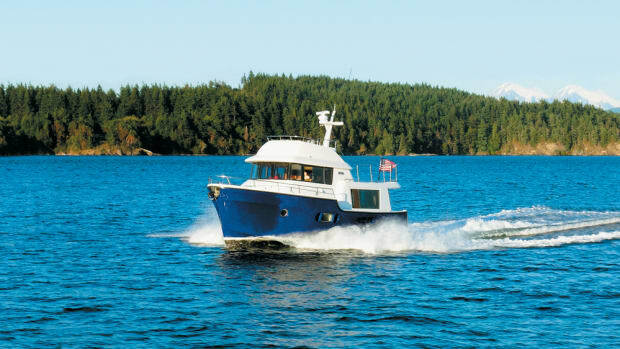 Judging by the four major yachts they have built, from the 72-foot High Pockets launched in 1992 and still owned by her original buyers, to Andrea Kay, a 120-footer, these guys build pleasure craft as well as they build hot pilot boats. The yachts don&apos;t look like work boats. They have big-boat styling, and appear to be perfectly fair and beautifully painted. I confess that these observations are based on photos Dawson extracted from his files: I have not personally boarded any of the ABD yachts. But to understand what they have in mind for the unnamed 72, visit the company website, abdaluminumyachts.com. 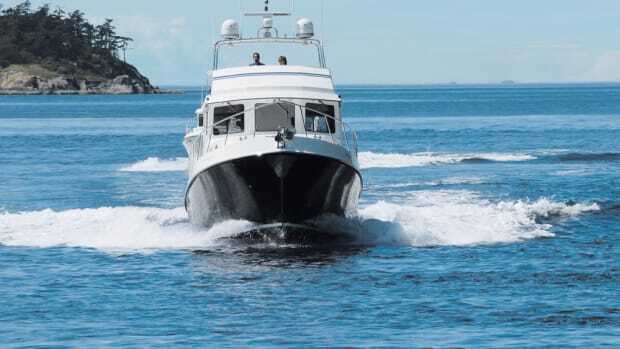 PassageMaker has been intrigued by ABD advertisements for the new yacht, partly because of promises that it can be operated easily and safely by a couple. A boat that large often is just too much for a husband-wife team. The 72 will have a single engine (likely a 450hp Caterpillar) and with thrusters fore and aft, two owners should be able to manage. Recently more couples have pushed through what we long considered the maximum size for operation by a couple. We&apos;ve been talking with a husband-wife team who operate an 84-foot Northern Marine by themselves. I hope to get aboard with them later on. My tour with Dawson was nearly virtual and I closed my eyes and opened my imagination as he described the spaces. A few small drawings offered a general idea: Even with generous side decks, the saloon is large enough to become the social center of any marina or anchorage. (A 21-foot beam helps, too.) Steps lead up to the raised pilothouse. She will have three staterooms and tons of storage space. We entered the machinery area through a door that opens onto the boarding platform. The first room could be crew quarters, but italso could be a shop, more storage, or the place to stow batteries and switches. It also could be an exercise room, with a treadmill or stationary bike, and more. Deeper into the boatwhere it was so dark it reminded me of a visit to a coal mineis the gaping hole that awaits an engine. Dawson says installation will be simple, even with the decks in place. It will be a stand-up-straight engine room. I think a 7-footer might be comfortable there. "We did the 70 earlier," he said as we left the boat. "This will have much, much more interior space." The company has been building boats since 1978. Among them were several 250-foot fire boats for use in the oil industry in the Gulf of Mexico. They have built passenger vessels that carry kids to school in remote areas of the province and they used to build seiners to 87 feet. But no one is building many fishing boats today. Eight of the company&apos;s 18 employees (an average number) have been with the builders since the first day. We drove to a neighboring marina where the first pilot boat was being checked out by her new owners. She was built to deliver pilots to huge ships slicing through rough seas at high speed. A thick collar of flexible impact absorbing material will protect the sheer line of the boat as the skipper uses three 600hp Man diesels and three Hamilton jet drives to hold her tight to the freighter while the pilot climbs aboard. The saloon has plush seats for four pilots, while the three-member crew is seated before a helm and navigation center that runs the full width of the boat. Below, there are some small cabins for breaks, a galley, and a huge engine room that is spacious despite housing three marine diesels, two Northern Lights generators, and the rest of the ship&apos;s gear. The pilot boat has two systems for recovering anyone who falls overboard: one is a traditional hoist stemming from a mast, while the second essentially is a mounted dip net that will reach into the water to make a rescue. She&apos;s no yacht. But she&apos;s obviously well built for a tough job. When I first called Dawson about the yacht and asked to see her, he told me construction had stopped but that I was welcome. He sounded optimistic about finishing the 72-footer, while acknowledging that another contract for more pilot boats and world-wide financial issues may slow progress. "I want to build 20 more before I retire," he told me. "I am 84."